The attraction for many gringos, of traveling and living in a foreign country, is the thrill of traditional open markets. When we first arrived here, we heard everything from: “everything is so cheap” and “its such nice / fresh / beautiful / unique products here” to “don’t go there – you’ll get robbed or mugged” and “I heard somewhere from someone that once someone got into some type of problem at a market in South America”. That makes it as just about as dangerous as everywhere else in the world. The fact is that the majority of markets are very safe – both in terms of crime and product quality. While this might not be true for the gringo couple dressed in Armani, with a dSLR camera around their neck and money falling out of their gold encrusted hands as they climb out of their BMW rental car on their way into an open market – most sensible travelers will have no problems whatsoever. If you follow this basic advice, you’ll be fine, and have a great time. $1’s, $5’s and coins at food markets and nothing over a $10 bill at a craft market. Not only will you draw less attention, the vendors simply don’t have change for large bills. And yes, a $20 is a large bill here. If you are planning on a larger purchase, keep your $20’s in a separate (front) pocket. There is no need to let everyone know that you have $100 or more on you, in cash. If you pull out a hand full of coins and $1 bills, no one will give you a second look. ● What is that? – ¿Qué es eso? (kay ess AY-so? Tip: The emphasis is usually on the second last syllable, unless noted by an accent mark. To carry all your treasures, you’ll need a sturdy bag. The locals use a multicolour woven (polyester – I think) bag. Vendors sell them at the markets for around $0.50 ea. It’ll make you look like you do this every week – at least more than if you troll the booths with your large piece of roller luggage. First rule of negotiating: Be Patient. Especially in craft markets, you’ll find that simply by not responding right away, the price of that hand woven alpaca wall hanging will decrease from $12 to $10 to $8 and finally to $6 right before your eyes. Often you won’t even need to say anything. Depending on the level of interest you show, you can often negotiate silently. Also, if you prefer not to barter the price down, you can often still make a deal. Last week we were at a leather shop – all beautiful handmade goods. The price sticker on the bag said $25 – which is an amazing price. Knowing that the prices all have room to move – it’s simply how business is done – we offered $25 (simply: “los dos por $25”) for both the bag and a small leather change purse (the price tag said $2) for our daughter. We got a little something, but didn’t beat up the vendor either. A word to the wise: don’t bargain too much or you’ll risk insulting the vendor, who often times is also the maker of the goods in his booth. When shopping at food markets, everything needs to be washed. This should go without saying, but its the manner of washing that’s important. Unless you want to risk getting sick, everything needs to be soaked in Grapefruit Seed Extract (Spanish: extracto de toronja). The local brand is “Kilol” and is sold at both Coral and Supermaxi supermarkets. It is a natural concentrate product that will kill anything alive on the outside of your fruits and vegetables. The cost is just $2.19 per bottle. It takes just a 15 minute soak to make it safe. Really is a must for all foreigners. Open markets are a great way experience the local culture and to save money at the same time. Follow these few suggestions and you’ll enjoy life like a local. Have a tip to share? Or maybe a question about shopping at an open market? Join us in the comments! Thanks Bryan, great tips, can’t wait to put them to good use. Thank you – it’s fixed now. I am very interested in moving to Ecuador,not so much my wife.Thanks for all the helpful info,please keep it coming. My wife and I are on the planning stage of an exploration trip to Ecuador. We read everything we can get our hands on. We need to brush-up on our Spanish language. Great advice to not haggling too much. I met an overzealous Italian in Cuenca who was so proud he got a shoe shine for 50 cents – the real price is $1 but the boy who gave it to him was likely so in need of money he would take anything. Great advice about the grapefruit extract. Been traveling w/ it for years for stomach and food poisoning issues. Never thought of using it as a food soak. Thanks! Great information, Bryan. I hadn’t heard about the grapefruit seed extract before but will definitely put it to use. I’ll be coming to Ecuador the first part of October for a couple of months and am excited to explore the country! Hi Jennifer, good point. We use 15-20 drops for 2 liters of water. Not sure where we got that ratio, but it seems to work! We read that you can take GSE as a type of "morning after" fix, in case you ate something that you were worried about – but just in case you were wondering, DON'T just drip it into your mouth – it'll burn your throat for hours. Just in case you were thinking about doing that (but you're probably not. . . ) Enjoy the markets! Great stuff! 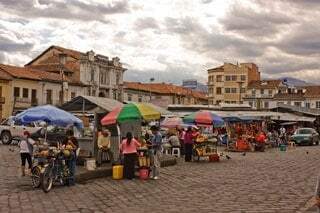 I had a dream about Ecuador and her markets last night. I had the privilege of living in Ecuador for 6 months a few years ago during university. Loved it! I've been trying to find a way back there ever since I left. Your story is inspiring and motivating! Great post, Mary, my wife, and I are retiring to the coastal area of Ecuador in the summer of 2011. We're starting in San Clemente and then will see where life takes us. Another tip is to bring along individually wrapped alcohol wipes so you can discretely wipe off the silverware when in smaller town/village restaurants especially on the coast. FYI: You are not allowed to bring seashells out of the country. There's a cute story that goes along with this bit of knowledge but not knowing who all reads these blogs, would not want to get our kind inspector into trouble. Keep up the great work, we appreciate any and all info that will aid in our move to this beautiful country. Thanks for your post and your suggestions. Sorry for my slow response. As you can see we have been in the midst of a full scale overhaul of our site. GringosAbroad.com is now replacing Destination-Ecuador. Everything is the same but there is significantly more content on the way. This format allows us to cover topics other than just Ecuador. Drop me an email when you arrive. I would love to interview you upon arrival, and maybe 6 months later. This is a great post. Thank you! I'm following along and reading as I find your posts. I'm hoping to get my husband to agree to visit. We have to get our passports in order first. Next: What Language in Cuenca?